Selling like hot cakes. Or hot kettles. 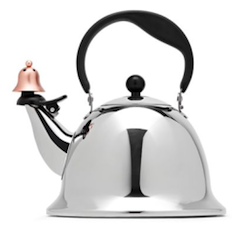 All it takes for an item to sell out online is one tiny comparison to Hitler to go viral and boom — JCPenney’s now infamous tea kettle is selling for big bucks on eBay. At least one of the $40 kettles has already sold for $199, but rest assured, tea fans, there are plenty more out there. While the $199 kettle is gone, there are some going for as low as $50 and others listed up at $189, so it appears there are plenty of people willing to shell out some major money just to own a brief blip in Internet history. We’re not sure if the tea kettles are being pulled from store shelves, as some are claiming, but if they are still for sale, it’s likely that they’re going fast. At least if this eBay sale is any indication. We’ve reached out to JCPenney to see if we can confirm if the product is still for sale and perhaps selling out at individual stores or if the retailer made the decision to stop selling it across the board. In the meantime, it’s always a good idea to thoroughly research product availability at list price before scooping up hot ticket items online. Because it would be a shame to spend all that money on a buzzed about item, only to have that controversy replaced tomorrow by a video of a cat scuba diving. The World Wide Web is a fickle mistress, after all.